Four pairs of eyes checked every knot, every length of webbing. Our lives depend on each piece being safe. A rope, a harness, and several knots allow Chris to descend the 190′ rappel. When friends invite you to join them on a trip through slot canyons on a 9-mm rope, there is only one answer. Our resounding “Yes!” brought us to a remote area south of Hanksville, UT, where we set up camp in the desert, all alone but for lizards and ravens. The best adventures start with lizards and ravens. Next morning at canyon’s edge, as we were gearing up for the first rappel, a loud long WHOOOOSH jerked our attention to the chasm. A pair of Peregrine Falcons was hunting for their next songbird meal, and one was in full stoop. The sound of that tucked-wing vertical dive (up to 200 mph) went to my core. This was a most auspicious start. Hours of revelry ensued. Rappels of up to 190 feet, down-climbs through contorted squeezy slots, and obstacles like a huge pothole of water at the bottom of 120 feet of rope make Constrychnine a canyoneering delight. Lest you think it is ALL fun and games, take note that every foot of descent must be re-gained in your exit from the canyon. When you’re tired. And it’s hot. And you are glad you did NOT know it was two hours and twenty minutes’ walk to get back to your camp and some cold drinks. More pictures are coming, eventually, but with my molasses-like internet connection this is all I could upload for now. Enjoy! P.S. Blog will be on hiatus for several weeks whilst I travel in the Canadian Rockies. Summer’s oven has been turned on; it reached 96 degrees today. 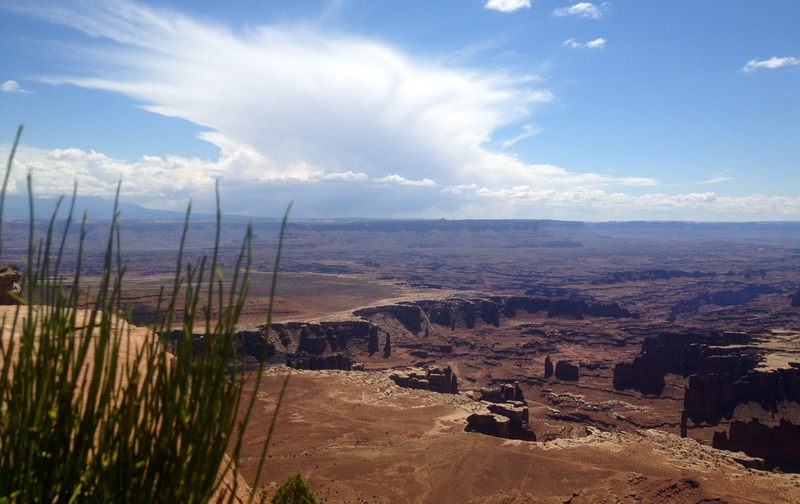 Temperatures won’t cool until fall here in Canyonlands. My geology talk was delivered in that intense unimpeded brilliance and blazing glare that defines our park until the summer rains bring some respite in July. Taking TWO ice-filled water bottles in my pack is the way to survive the 2.5 hours at the overlook. That air-conditioned government car taking me back to the visitor center is a much-anticipated cocoon of refreshment. Those who aren’t cut out for the mostly-oppressive heat don’t last in this harsh environment. While I may not enjoy baking/melting inside my polyester-and-wool uniform, it’s all about attitude. When you sport that cool hat that keeps the sun off your face, that hat that makes visitors’ faces light up as they hail you with “Hey, Ranger!”, you can put up with a lot of discomfort. Note: today’s skies don’t resemble the above photo. That was an unusual formation last month that caught my eye. Blue and cloudless is the norm in our 300 sunny days per year. 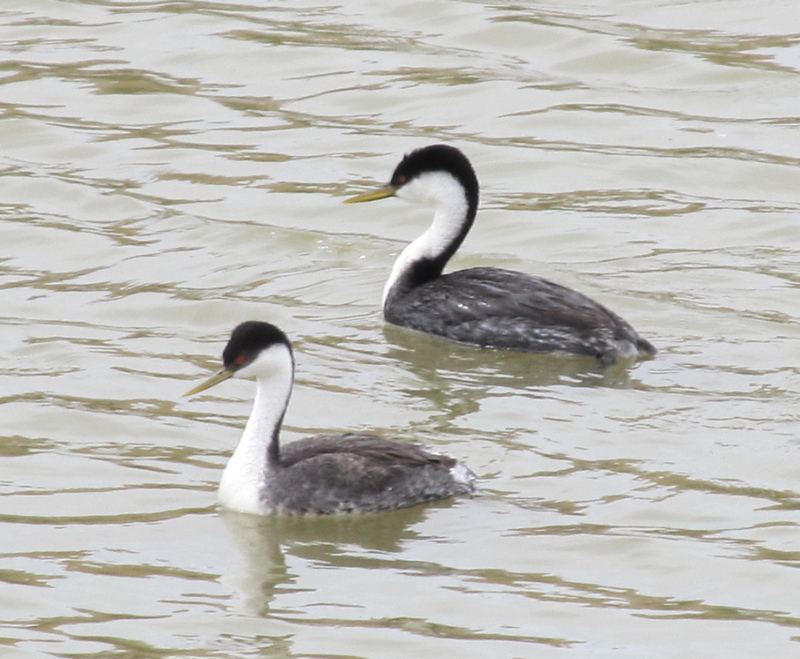 Pair of Western Grebes bob in the shallow waterway. 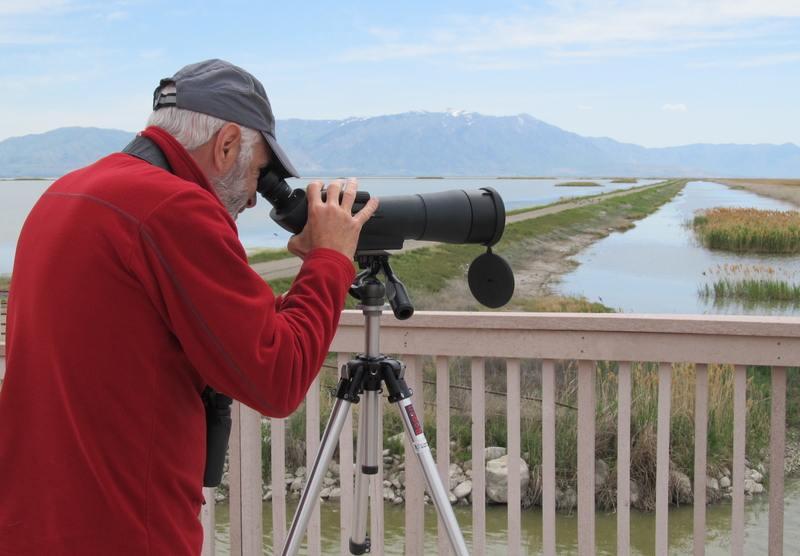 For three years I’ve been wanting to investigate the Bear River Migratory Bird Refuge — one of Roger Tory Peterson’s top twelve birding hotspots in North America. It was finally time. Tucked between the Wasatch Front and the Promontory Mountains, wetlands at the north end of the Great Salt Lake provide habitat for over 270 bird species in an other-worldly setting. The sun was just rising over the mountains as I cruised down the Auto Tour road with my beloved Chris. By dawn’s light, our first birds standing in the open grassland looked surreal; their prodigious curved bills seemed out of proportion to their bodies. Long-billed Curlews called to one another, trying to get the attention of a possible mate, courtship rituals making them oblivious to our presence. Spotting scope’s higher magnification is necessary in wetlands. Water levels are managed by huge system of dikes and valves. Further in, grasslands gave way to shallow ponds which teemed with waterfowl. Spotting scope replaced binoculars. “Hey — that grebe looks slightly different from the others.” A quick look in the Sibley field guide confirmed that we were seeing Clark’s Grebes in among the dozens of Western Grebes. A lifer! Chris added the species to our growing list of sightings on this flawless late-spring morning. American Avocets and Black-necked Stilts occupied every shoreline, making me smile and shake my head at rich colors, bold patterns, length of legs. White-faced Ibis and Cinnamon Teal appeared around each turn of the road, with various herons and egrets dotting the landscape. An occasional White Pelican fished in the distance while the voices of Sora and American Bittern intrigued us from rushes nearby. 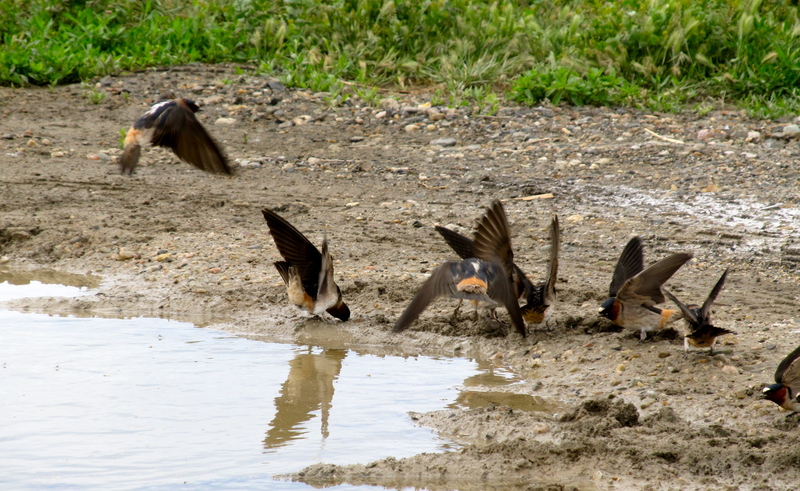 Cliff Swallows by the dozens fluttered into mud puddles to pick up nest construction material. A Marsh Wren peeked out from her pouch-shaped nest built on cattail stems. Perched on a driftwood log, a Peregrine Falcon waited patiently for its next meal to pass by. Four dozen species — a memorable May 22. These Cliff Swallows never stopped fluttering their wings while picking up mud balls for their nests. They were highly selective about mud’s consistency. And you know what is even MORE glorious? Sharing a day of discovery with one who delights at your delight, sees things you can’t see, connects the dots on avian ecology, and opens your car door for you even though you’re perfectly capable. Chivalry? Alive and well. Being in love? No words to describe.